To begin the morning session, attendees were loaded onto the tour wagons and headed to the sheep handling facility. 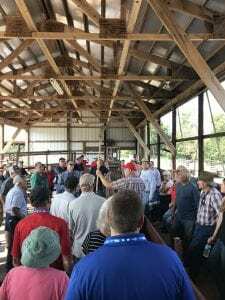 Here, shepherds were introduced to Dr. Steve Boyles and Dr. Tony Parker to discuss appropriate animal handling and the use of animal handling systems. Prior to entering the handling facility, Dr. Parker noted the importance of maintaining a “clean yard,” especially from toxic weeds. For those producers that may not use their working areas on a regular basis, ensuring that this area is clear of noxious weeds and debris will be of benefit when it comes to the day of working sheep. 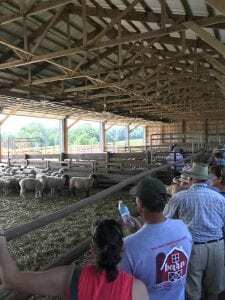 As shepherds entered the working facility, Dr. Boyles began noting the design of the handling system starting with the tub or area in which sheep enter the working system. Here, Dr. Boyles pointed out a mistake that many make when loading any handling system. When loading the tub, the rule of thumb is that a half full tub is full. Over crowding the tub can result in issues when you begin loading the chute. Another piece of advice that Dr. Boyles offered was the use of highly visible objects as a tool to move livestock. Using a stick or pole is less effective as sheep have poor eyesight. The use of a broom or hat will be more effective in getting an animals attention. At the conclusion of the handling session, Dr. Parker drew attention to the latest piece of equipment at EARS, the Te Pari auto drafting system which will be used in an up coming research project. Stay tuned for updates on this project! After the handling session, it was off to the lambing barn where EARS farm manager Mr. Wayne Shriver and Dr. Monique Pairis-Garcia discussed the importance of a quality lambing facility. Wayne began the conversation discussing the reasoning behind lambing indoors. He described it as simple as the farm was able to get rid of two huge risks, parasites and wildlife predators. Wayne described the feeding design in this system as well as monitoring the temperature. He noted that a barn does not have to be extremely warm for new born lambs, simply keeping the wind off of the sheep will do the trick. Amongst this conversation, Dr. Pairis-Garcia noted the importance of stocking density in this type of system, especially during parturition or birth. When a ewe approaches parturition, she will separate herself from the rest of the flock. This will allow the ewe to devote all of her time towards the establishment of the ewe-lamb bond and develop a close maternal relationship with her offspring. These are important natural behaviors to take into consideration when determining the number of animals that will be placed in a specific area within a barn. Both Dr. Pairis-Garcia and Wayne noted the importance of learned behaviors as well. Young lambs learn a lot from their mothers. Therefore, allowing them to remain with their mother for an extended period of time will be of benefit as lambs learn to either graze or consume feed. 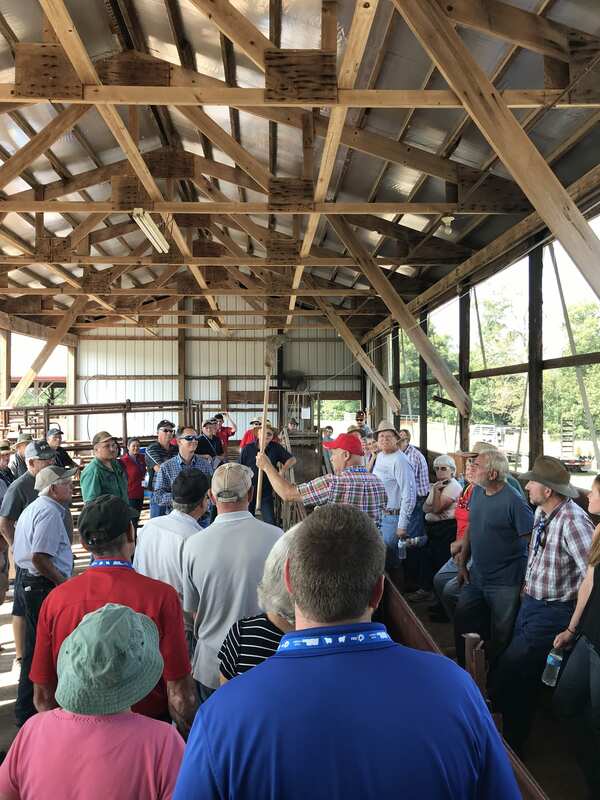 Once the lambing session wrapped up, attendees traveled back to the lamb feeding barn where they were introduced to Dr. Ale Relling, Dr. Lyda Garcia, and Clif Little to discuss the importance of alternative feeding systems. Dr. Relling began with discussing the basics of ruminant nutrition. Dr. Relling and Clif Little also mentioned the design of a new study that they are interested in regarding the use of soy hulls as a means to reduce the need for large amounts of harvested forages in the form of hay. 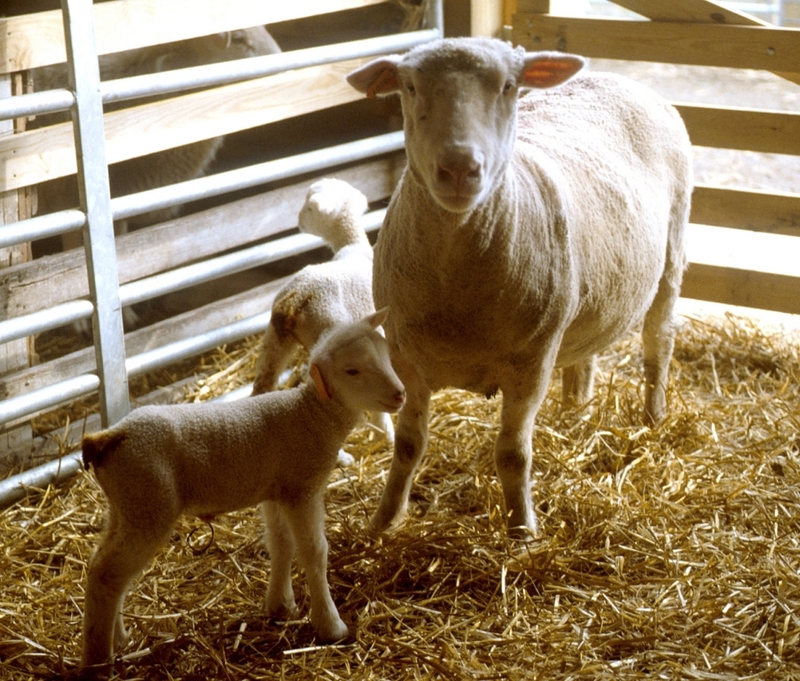 Reducing the use of hay as a means of nutritional sustenance could reduce the cost of feeding lambs as well as labor involved. Taking the thought of a feeding program to the next level, Dr. Garcia concluded the session with a discussion on the effects of diet on carcass quality and variability of lamb carcasses. Feeding lambs high concentrate diets will result in fatter carcasses, whereas lambs fed a forage diet will yield leaner carcasses. Diet will also play a key role in the flavor profile of lamb. Finding the right market for the product you are producing is key to market success. After the feeding systems session and lunch, it was off to the field to take in the pasture session of the afternoon. 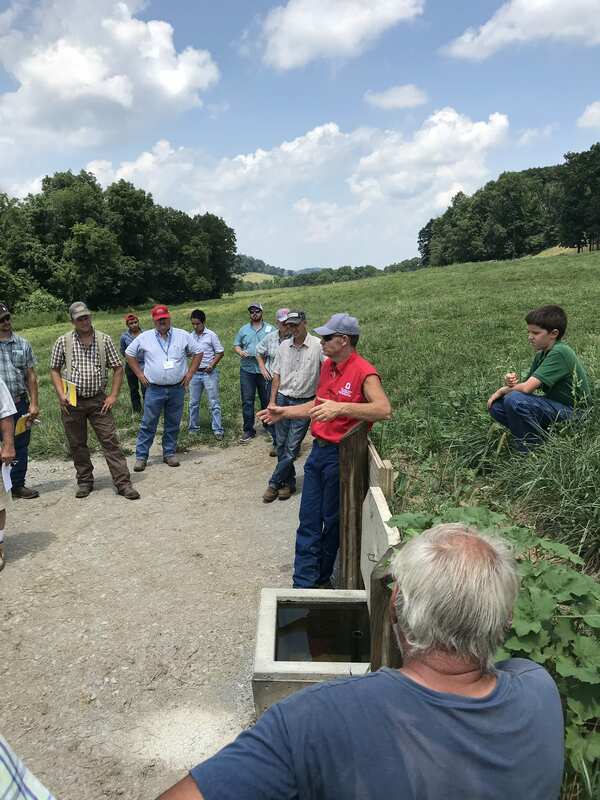 Several presenters including Christine Gelley, Clif Little, Wayne Shriver, Jay McElroy, Stuart Heavilin, Bob Hendershot, Rory Lewandowski, Ted Wiseman, and Dr. Jeff McCutcheon discussed the on-going pasture research, fencing and water systems, and pasture plants species. To touch on a few of the highlights from these discussions, the extension agents explained that the basis of the pasture research was to determine the optimal time period to clip pastures and when fertilizer should be applied. Clipping pastures cost an average of $18/ac, so determining the best management strategy in maintaining pasture health and viability is key in the sustainability of a pasture dependent operation. In expanding upon pasture maintenance, the design of pasture fields and allocation of water is extremely important. To make the best of a grazing area, pastures should be made as square as possible. 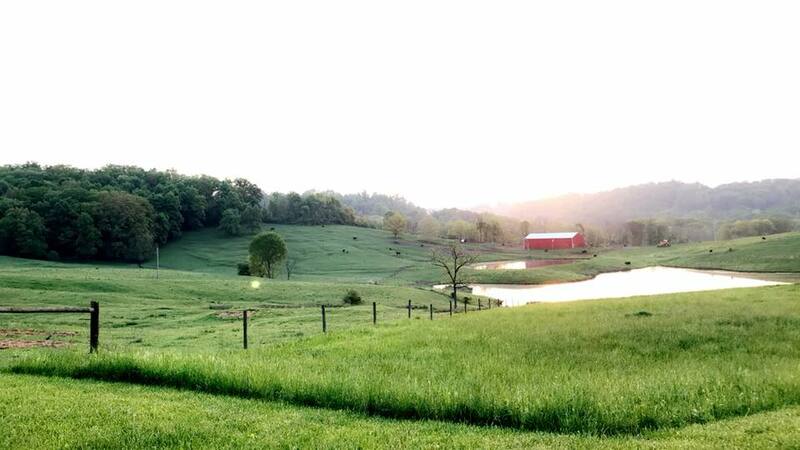 In addition, in a pasture setting, water should be available every 800 feet. Both of these bits of advice will allow for even grazing and distribution of nutrients. 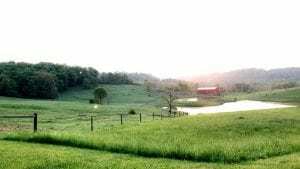 In addition, with the high temperatures that we are experiencing, placing animals in pastures that are high in legumes will make for a cooler environment for grazing livestock. Legumes respire at a greater rate when compared to grasses and in turn maintain a lower temperature. 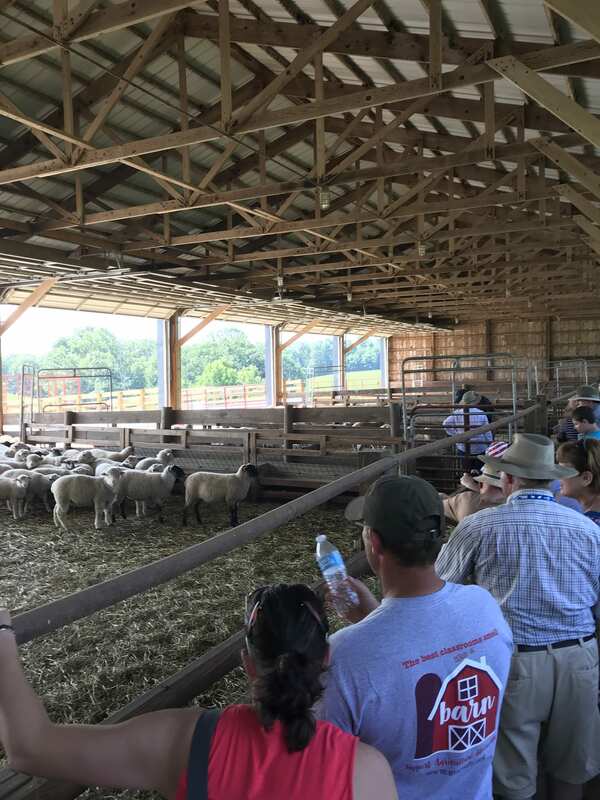 The next Ohio Sheep Day is scheduled for the summer of 2019 and will be hosted by the Jackson Agriculture Research Station in Jackson, OH. More details on the event date and scheduled speakers will be provided at a closer date.